Between July 1 and October 31 you can drive to the top of Mt. Shasta, or at least to about 10,000 ft of 14,180. It's pretty barren and rocky there with spectacular views. I like the emerald green vegetation against the golden greens. 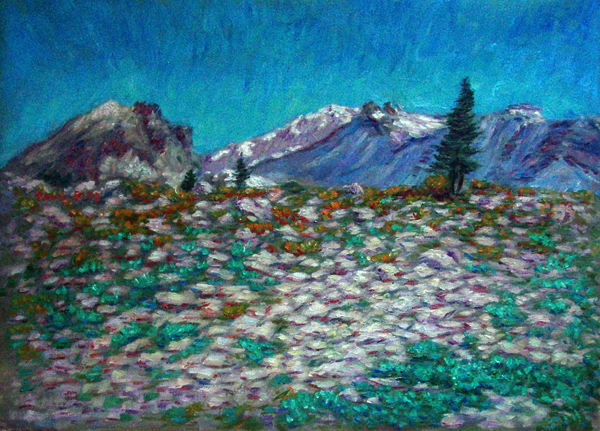 It's hard to see in this photo but the rocks along the ground are accented and defined with strong violet strokes. The blue accents in the mountain set it back and the dark red accents in the big peak on the left bring that and the one on the far right forward. I really like that subtlty with this painting.